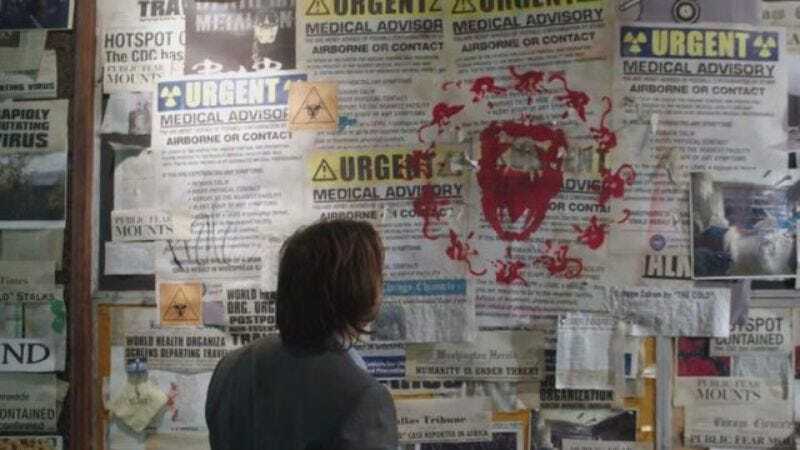 The Army Of The 12 Monkeys will fall back into line on April 18—according to Deadline, that’s the premiere date that Syfy’s just announced for the second season of time traveling and virology. Terry Matalas and Travis Fickett’s sci-fi series was solid in its first season, wrapping up last year with the same speech with which it began (time being a flat circle isn’t just a notion for pay-cable dramas). From the looks of the season-two trailer, posted below, people’s loyalty and blood (presumably) will be tested. And speaking of 12 Monkeys, former showrunner/monkey-wrangler Natalie Chaidez’s new series, Hunters, has also gotten a premiere date. The alien drama, from The Walking Dead executive producer Gale Ann Hurd, will debut April 11, and will, fittingly enough, air right after 12 Monkeys once that show returns. The new series, based on Whitley Streiber’s Alien Hunter novels, follows the “adventures of a secret government agency that protects the world from extraterrestrial terrorist threats.” We get it, Syfy: No place—or time—is safe. Oh, and here’s the Hunters trailer, too.